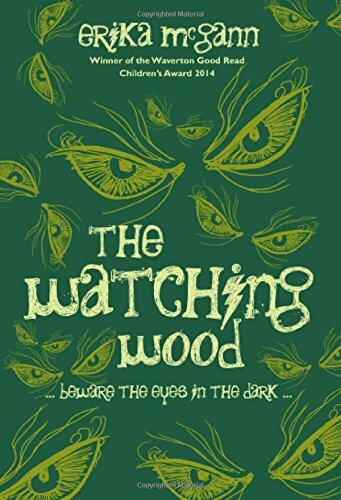 Erika McGann wastes no time in plunging her readers into action-packed, magical adventure in The Watching Wood, the latest of her books starring young friends and apprentice-wiccans Jenny, Rachel, Una, Adie, Grace and new recruit Delilah. Before you can say ‘Abracadabra’ the six of them have been sucked clean out of an evening training session in flame-running and dropped into a strange new world, and the middle of some serious Witch Trials: that’s Witch Trials in which witches compete with one another, rather than the other kind, though they still feel pretty life-or-death. It says a lot for McGann’s skill as a storyteller that within a couple of lines the reader will have accepted this completely and be engrossed in the girls’ new adventure. The world they’ve ended up in is a dangerous one, and getting back home is going to be a real challenge particularly when it’s discovered that the girls are human. I’ve really enjoyed the previous books in this series, The Demon Notebook and The Broken Spell, and once again, McGann has created a satisfying, entertaining page turner. The girls’ relationships with one another are fun and feel realistic; the dialogue sparkles; and the scariness is lightened with humour, without it reducing the tension. There are lessons within the story about loyalty, and seeing what’s really important, but they are lightly done. And the castles, dungeons, fairy creatures and magical wizardry match pretty much anything you’d come across in Hogwarts. How good it is too to see an all girl gang wielding the wands and taking centre stage.